Like Randall, I’ve been keeping bad company lately. 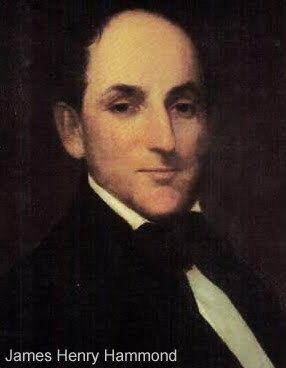 My unsavory companion has been South Carolina’s James Henry Hammond, a leading figure before the American Civil War, who served as a US Senator from 1857 to 1860. Hammond was one of the South’s wealthiest planters, owner of hundreds of slaves, a member of the South’s elite. He was also arrogant, clueless, and a sexual predator. On March 4, 1858, Hammond stood up in the Senate and delivered a speech that most people know for its famous line: "Cotton is king." Historians tend to point to this speech for its misguided conviction that, if the tensions between the sections came to war, the South would win handily. In his speech, Hammond pointed out that the South encompassed 850,000 square miles—more territory than Great Britain, France, Austria, Prussia, and Spain—with a population more than four times what the colonies had had when they successfully revolted against England. The South had fine soil and good harbors, and it grew the crop on which industrial societies depended: cotton. If the South withheld its cotton from market for a year, entire countries would fall to their knees, Hammond declared. Cotton was king, indeed, according to Hammond. As notable as this speech was for its assertion of Southern power, it was even more astonishing for its view of human society. It was here that Senator Hammond outlined what Abraham Lincoln later called the "mudsill" version of life. According to Hammond, all societies were made up of two classes. On the bottom were the "mudsills": drudges who were lazy, stupid, loyal, and happy with their lot. On this class rested civilization: the wealthy, educated, cultured men who advanced society—men like Hammond. This class should always lead society, for only its members knew what was best for a nation. If the mudsills ever got power, they would demand wealth redistribution, and human progress would halt. This was, of course, the same era that saw extraordinary upward mobility in the United States. Immigrants were pouring into the North, beginning their climb to economic security or even prosperity. Young men and women were moving west, pushing Indians out of the way to improve their own lot, as well. At a time when wage workers were actually moving upward at an extraordinary rate, Hammond dismissed them as dimwits, condemned to drudgery to support the lifestyle of people like him. Hammond’s vision was troubling enough, but his arrogant elitism was worse. When Hammond spoke, the nation was convulsed over a civil war in Kansas. Events there were very complicated, but by 1858 it was clear to everyone that the machinations of a pro-slavery legislature had enabled a rigged convention to draft a state constitution that the vast majority of settlers in Kansas loathed. This presented a legal conundrum, but while different sides argued, people died, in particularly brutal ways. Kansas was the issue of the day, and had been for almost four years. What did sitting Senator Hammond, one of those to whom society should be trusted, say about this horror? Why should he have bothered to learn anything about the major issue of the day? He already knew how a successful society should work. He didn’t have to bother about facts. Hmmmm...sounds awfully similar to the Republicans' contentions about how America should work.